The first and foremost concern is, naturally, the chocolate. Sephra sells several types of ready-to-use chocolate pellets that can simply be microwaved and poured into your machine, but if you want to try using your own chocolate in the fountain, you will be in for a little bit of extra preparatory work. 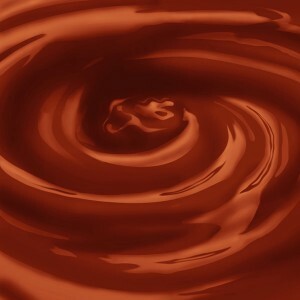 Some store-bought chocolates may have a high enough oil content to flow through the fountain smoothly once melted, but many chocolates will need to be mixed with a bit of extra oil to reach a thin enough consistency to flow properly. Choose an oil with a mild flavor (such as canola or vegetable oil) to avoid polluting the taste of your chocolate, and do a “test run” before your event to determine how much oil needs to be added to each kind of chocolate that you want to serve. Melt a portion of the chocolate and mix in a small amount of oil at a time until the chocolate is appropriately thin, keeping track of how much oil you have added. Then, simply scale as necessary when preparing for your event. A good general rubric to use when preparing your chocolate is to add about 3/4 cups oil to 24 ounces of chocolate chips (of your choice) and 3 unsweetened chocolate baking squares, but some modification may be necessary depending on the type and brand of chocolate that you buy, so be sure to test it out first. Don’t be afraid to get creative with your chocolate selections; replacing some of the chocolate chips with peanut butter or butterscotch chips, for example, is a great way to add an element of uniqueness to your chocolate fountain table. If you are catering a large event, it may be necessary to have multiple fountains to maintain traffic flow. If so, consider using a different type of topping in each fountain to give the display a bit of extra presence. Replacing the chocolate with caramel sauce is a popular alternative to the usual fare, and it will give your fountain setup an air of variety. Running caramel through your fountain can be a bit tricky, though, as it tends to be more dense and stickier than liquid chocolate and can easily clog up your machine if it is too thick. If you want to take the homemade route and mix up your own caramel sauce, be sure to sufficiently thin the sauce before feeding it through your machine. For those who would prefer to simply buy their sauce, Sephra offers a pre-mixed caramel sauce that is specifically designed to thin easily with the addition of water or – for a little extra flavor – apple juice. Sephra also offers an assortment of ready-to-use fruit coulis sauces that require no heating and can be used in lieu of chocolate. Just as important as the fondue, however, are the food items that you will be dipping into it. 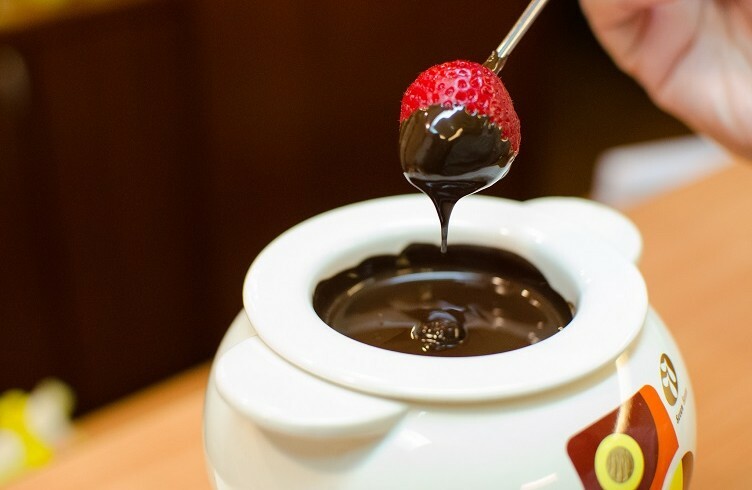 While sliced fruits and chunks of cake are usually the first things that spring to mind when the words “chocolate fondue” are mentioned, there are plenty of other inventive options that you can offer along with the traditional standby items. Adding a few savory “dippers” to your collection of sweets will help break up the sugar onslaught and keep your guests coming back for more. Items such as pretzels and nuts (be sure to provide a spoon for drizzling chocolate over smaller items) are great examples. For a slightly more unique and “unconventional” addition to your dipping spread, consider serving some homemade candied grapefruit peel with your chocolate. To prepare the grapefruit peel, simply remove the peel of several grapefruits from the fruit and slice it into thin, 1/4 – 1/3 inch strips. Using a sharp knife, remove as much of the white pith as possible from the inside of the peel. Place the peel in a saucepan of cold water, bring to a boil, and boil the peels for one minute. Drain the water from the pan and refill with cold water. Return to a boil and boil peels for one more minute. Drain again and repeat this process a total of four or five times. The boiling water will retain the bitterness of the grapefruit peel (and therefore will not effectively “cook out” the bitter flavor) if it is not refreshed several times, so try not to give in to the temptation to skip this step. After the grapefruit peels have been blanched several times, bring 1/2 cup of water and 1 cup granulated sugar to a boil in a heavy pan or skillet and stir until sugar is dissolved. Add the peel and stir until most of the syrup has been absorbed. Place peel on oiled or otherwise non-stick baking rack and allow to dry, uncovered, for about 8 hours (or until only slightly sticky) at room temperature. Toss the dried peels in superfine sugar until the surface of each peel is sufficiently dusted. Shake off the excess sugar, and you are ready to set these natural candies out with your chocolate fountain. This candying procedure will work with most kinds of thin-peeled citrus fruits (lemon, orange, etc. ), so feel free to offer a variety of different candied peels to your guests. Really, there aren’t any hard rules about what you can or can’t dip in your chocolate fountain (aside from crumbly things that might clog up the pump), so feel free to experiment with different sorts of dipping items until you find a unique and intriguing combination that really excites your guests. As chocolate fountains become a more and more popular item to have on the desert table, you will definitely want your spread at each event to be interesting and memorable, so don’t hesitate to branch out and offer different or “weird” items that you think will go well with your chocolate. Whether you’re planning a wedding reception, looking to add a bit of extra flair to your catering options, or you just want to enjoy the occasional evening of chocolate indulgence at home, J.E.S. has all of the Sephra equipment that you need to get started.